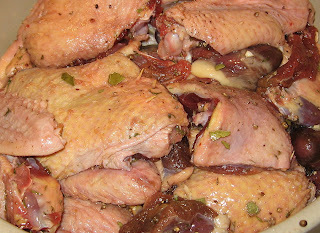 A long weekend of preparing various parts of ducks, geese, and chickens for a big batch of confit and several pâtés en terrine. I ended up with 14 pounds of mostly goose meat, and prepared it with a rub of salt, pepper, bay leaf, thyme, and garlic. In addition to the breasts, legs, and wings, I also had a fair number of gizzards and hearts. I cooked about half of them in the confit, and kept the other half for a few rustic pâtés.